This ticket gains you access into the event and Open Bar from 9pm-11pm. The best deal in town to watch this fight! Who's ready the best boxing matchup so far this year? 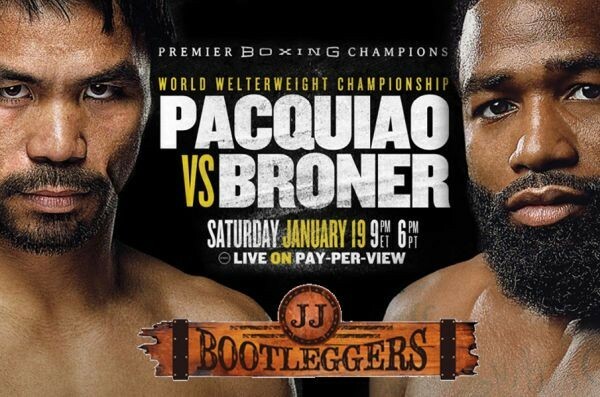 On Saturday, January 19th join JJ Bootleggers for their watch party of Pacquiao vs Broner! Come early to catch a seat, drinks, and food. This event will likely sell out! Ticket prices subject to increase. JJ Bootleggers is one of Pennsylvania's first moonshine themed restaurants located in our country's birth place, Philadelphia. The bar offers a great selection of libations but likes to focus on moonshine and moonshine signature cocktails. We did not forget about the beer lovers as we offer ten rotating drafts and a wide selection of canned and bottled beers.